Home > stories > Bicycle Shops: Convenience Store or Outfitter? Good Bike Co in Prineville, OR is a great example of an “outfitter” style bike shop. After visiting bike shops around the country over the last half dozen years, this got us thinking about how we’ve experienced bike shops as end users. For us, bike shops either function as convenience stores or outfitters. There are shops that only focus on retail and don’t bother with creating an experience for customers and visitors – these are the convenience stores. It is a wham bam thank you ma’am affair with little follow up after the sale. Then, there are shops that focus on retail, and also go the extra step to create an experience for customers and cyclists – these are the “outfitter” type shops. These shops have group rides, host events, or employees that are always eager to share their latest bike touring route or perhaps they even lead a tour themselves. These outfitter style shops also function as a third space, maybe they serve coffee, beer or have monthly gatherings and presentations. Their focus is not only on selling new product, but educating and inspiring you to use the new product. They are your guides, gurus (sometimes a therapist) and ride leaders, as well as your salesperson and mechanic. 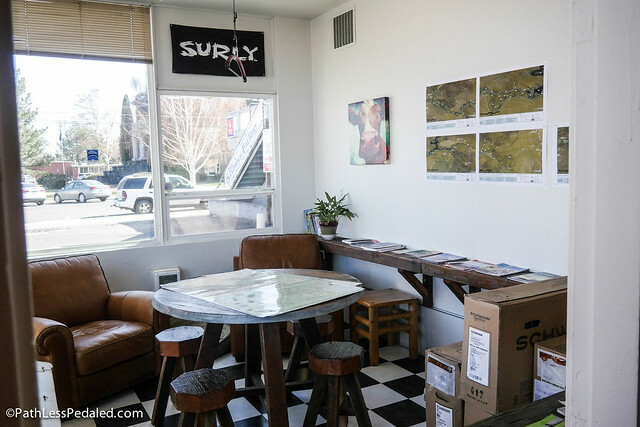 Every bike shop should have an adventure planning room with maps, right? We know that this is often a big ask for small shops with little capacity, and there are also some shops that do enough volume through online sales that they are immune to having to develop the community piece. However, with more brands offering direct to consumer, we feel that bike shops will have to offer something of value that will compete with the ease of clicking a button with your pajamas on. We think many shops can benefit by adding “outfitter” style elements from a bike tourism perspective. Any shop can curate a short list of rides that people can do in the area. It could be as simple as printed cue sheets and maps at the front counter or downloadable GPS routes from the shop website. We’ve seen a few shops go that extra step and lead actual bikepacking and bike touring trips like Topanga Creek Outpost (notice how it’s an “outpost” and not a bike shop! ), River City Bicycles and their new River City Touring Club, and Good Bike Co and their guided agritourism tours. 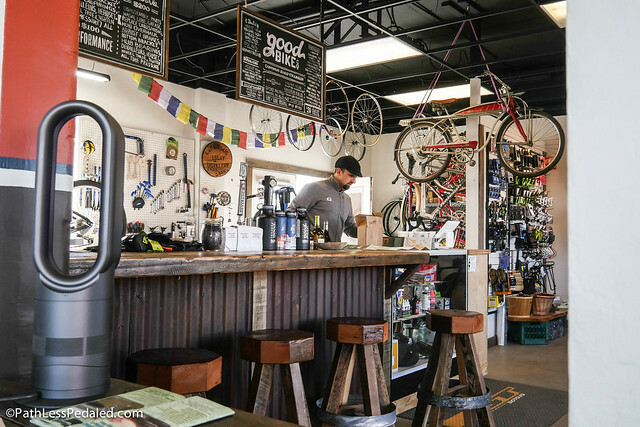 From a bike tourism perspective, shops with an “outfitter” mentality are essential because they offer a hospitality and guiding component that is necessary for successful bike destinations. From a customer perspective, the “outfitter” mentality creates an opportunity for people to be educated/inspired on how to use the gear they just bought (“where can I play with my new bikepacking gear?”) as well as provide a support group around the Cycling Experience. This you can’t buy on the internet. What do you guys think? What shops do you feel have the “outfitter” mentality? We’d love to know! For sure, Omaha Bicycle Company in the Benson neighborhood of Omaha NE is an outfitter by your definition. Yeah. Love the online presence of that shop. We cruised by the last time we were in Omaha, but had just missed their open hours! OBC is definitely a place to stop and get info and get outfitted. Plus, they have really good coffee and baked goods! Patuxent Adventure Center in Solomons, MD fits the “outfitter” bill to a tee! They are great!!! I’d just be happy with local bike shops that simply have bike parking! The majority of shops I find seem to have car parks for you to rock up with the bike on the roof of the 4WD, but nowhere to park and lock a bike if you ride up!